Welcome to the 21st century and Acappella’s 21st album! 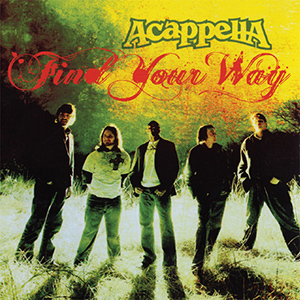 Once again produced by Keith Lancaster, Acappella’s new album, Find Your Way, is a mix of strong harmony and sound biblical lyrics. You’ll find yourself tapping your toe and memorizing scripture without even knowing it. Featuring Acappella’s trademark strong bass and soaring tenor, Find Your Way marks a triumphant return for the quintet since their last release of Radiance three years prior. More than ever, this album highlights Keith’s unique approach to song writing while the guys in the group step up to the plate and knock it out of the ballpark. For a “behind the scenes” look at the album, the group, and the story behind the songs, listen to Episode 14 of the Pitch Pipecast.